Strongwell’s on-site 10,000 sq. ft. laboratory is now equipped with a new Instron 5984 Materials Testing Machine with an Environmental Chamber. Research and development is vital to the company’s future and reliable material property data is necessary for design and development. Strongwell is ISO 9001:2008 certified and is committed to providing products in accordance with internal and customer specifications. The Instron 5984 Materials Testing Machine validates the mechanical material properties that must meet or exceed these specifications. 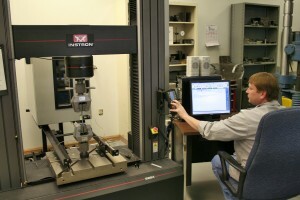 The testing machine will provide precise and accurate measurements of material properties needed for material certifications, design analysis, product development, and materials research. Standard ASTM test methods including tensile, compression, in-plane shear, flex, short beam shear, and bolt bearing are common tests. In addition, custom test methods can be readily developed and reused in the future. Strongwell has always saved valuable time and money for customers by offering the capability to test in-house. This new machine can help significantly shorten testing time because acquiring a test quote and sending material to a third party lab typically takes longer than actually performing the test. The Instron 5984 Materials Testing Machine is a dual column floor mounted electromechanical testing system with a load capacity of 33,750 lbf. It has an extra-wide load frame and T-slot table with a horizontal test space of 36.8 inches for custom and full section test applications. The integrated closed-loop control and data acquisition system insures accuracy and reliability. Extensometers or strain gages can be used in conjunction with the load cell channel for a variety of output formats. A notable improvement to Strongwell’s new load cell is the fact that it can be calibrated down to 1/500th of the rated load. This results in better accuracy for tests that require very low loads. The Environmental Chamber allows for material testing at temperatures up to 350°C and down to -70°C. An optical window in the Environmental Chamber allows for visual observation of the test and the potential to utilize optical extensometers.